In order to use these basic in-ear headphones with an iPhone you have to spend an additional $9 on a Lightning to 3.5mm headphone jack adapter. Delta has legacy 3.5mm gold plated plug. The means right out of the box you can use them with any older iPhone, iPad or iPod, and any Mac, but if your device has the tiny Lightning port, you need the adapter. The sound is clear but lacking on bass. I found high notes or big crescendos distorted and at times harsh. Volume can only be controlled directly from your phone or other device. The inline control allows you to take telephone calls and disconnect; it does not control volume or media. You can’t jump from track to track using the inline control. 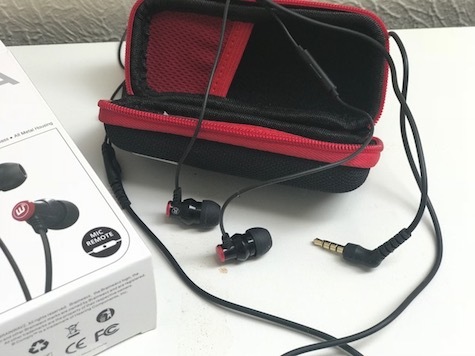 For $28 the buyer gets earphones that are loud and clear enough for casual listening. For that price it’s unwise to expect audiophile quality. Brainwavz Delta earphones come with an attractive zippered case and extra ear tips that enable you to find a comfortable fit. MyMac review rating is 6 out of 10.